A soldier stands guard on a military speed boat during Iran’s navy exercises in the Strait of Hormuz on December 28, 2011. 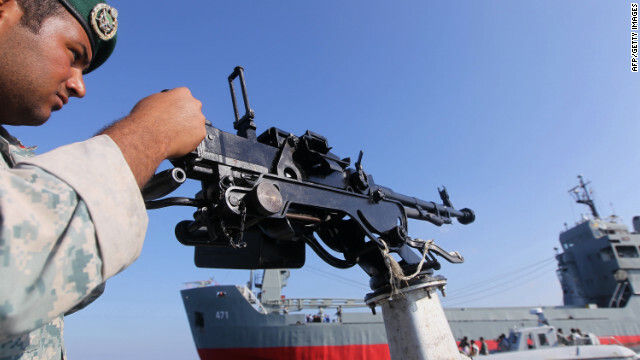 (CNN) — The United Kingdom said Saturday it plans to send a warship to the Persian Gulf, a move that follows Western criticism of Iranian threats to close the Strait of Hormuz. The UK Ministry of Defense described the deployment of the HMS Daring as “long-planned” and “entirely routine.” The destroyer will replace a frigate stationed in the area, it said. Still, in the past two weeks both U.S. and British defense officials have denounced any move by Iran to close the strait, the only outlet from the Persian Gulf and a key trade route for oil. Iran threatened in late December to block the strait if sanctions were imposed on its oil exports. France, Britain, and Germany have all proposed such sanctions to punish Iran for lack of cooperation on its nuclear program. Rear Adm. Ali Fadavi, of Iran’s Islamic Revolutionary Guard Corps, said last month the world could not last 24 hours without Persian Gulf oil, and that Iran is capable of closing the strait. “Today, out of the 1,300 billion barrels of oil in the world, 800 billion barrels are in the Persian Gulf,” Fadavi told Iran’s Press TV. The U.S. Navy said the threat to block the strait is unacceptable, as the flow of goods and services is vital not only to the region but to the world. “Anyone who threatens to disrupt freedom of navigation in an international strait is clearly outside the community of nations; any disruption will not be tolerated,” Cmdr. Amy Derrick Frost, spokeswoman for the U.S. 5th Fleet based in Bahrain, said at the time. Earlier this week, Britain’s secretary of state for defense, Philip Hammond, warned that any Iranian attempt to close the strait would be illegal and unsuccessful. “Disruption to the flow of oil through Straits of Hormuz would threaten regional and global economic growth,” Hammond said in a speech in Washington on Thursday. An IRGC commander told Press TV the drills would be different from previous ones, though just how wasn’t clear. Iran launched a 10-day drill in the strait in late December. Physically closing the strait would require means that likely are not available to Iran, said Professor Jean-Paul Rodrigue of Hofstra University. “At best, Iran can posture and potentially disrupt traffic for a short duration,” said Rodrigue, who specializes in global trade and maritime transportation issues. Frost said Navy “maintains a robust presence in the region to deter or counter destabilizing activities,” and works to allow commercial shipping to operate freely.